For the town in Derbyshire, see Ripley, Derbyshire. For the village in North Yorkshire, see Ripley, North Yorkshire. Ripley is a village in Surrey, England. The village has existed since Norman times – the chancel of the church of St. Mary Magdalen shows construction of circa 1160 there and supporting feet of fines and ecclesiastical records mention the village at the time. Ripley's sister village of Send to the south-west was the governing parish over the village for over 700 years until 1878 when they became two separate ecclesiastical parishes; they became separate civil parishes in 1933. Lying on the main road from London to Portsmouth (from the 1930s referred to as the A3), Ripley was the post town for the whole area (including Woking) from 1813 to 1865. With the coming of the railway to what was then Woking Common in 1838, Ripley's importance diminished, and Woking became its post town in 1865. As motor traffic increased during the 1960s and the 1970s, the Portsmouth Road at Ripley became a notorious bottleneck, relieved by the building of the Ripley bypass in 1976. The A3 was renamed the B2215, and what has always been a major trunk road was expanded into six lanes north of Guildford, bypassing Send and Ripley. The distance is 3.5 miles (5.6 km) to the M25 motorway. It is centred 6.2 miles (10.0 km) southeast of Woking, 6.8 miles (10.9 km) northeast of Guildford and 22.5 miles (36.2 km) southwest of London. Neighbouring villages Send and Send Marsh to the South-West and Ockham to the East have fewer shopping facilities. The village includes a coaching inn, the Talbot Inn, which dates back to 1453, as well as The Clockhouse (formerly Drake's) restaurant, which has been awarded a Michelin star and 3 AA rosettes. The village high street includes two small supermarkets (One Stop, Budgens), cobblers and a bakery. The other pubs in the village are the Jovial Sailor, The Anchor, The Ship Inn, The Seven Stars and The Half Moon. The village church of St Mary Magdalen has a fine Norman chancel and is a Grade II* listed building. Ripley has two schools, Ripley C of E Primary School and Ripley Court Preparatory School, a private school. Ripley is mentioned in H. G. Wells' novels The War of the Worlds and The Wheels of Chance. The Arthur Conan Doyle short story of Sherlock Holmes’ The Naval Treaty, includes a setting in Ripley. Ripley is the birthplace of the acclaimed rock/blues guitarist Eric Clapton, and resting place of his son, Conor, who died after falling from his mother's New York apartment window..
Paul Weller is a long-term resident of Ripley  and runs local recording studios Black Barn Studios. Cricket has been a popular sport in the village for 200 years and is played on the Green. In the 1870s, cycling also became a popular activity in the South of England and Ripley was a convenient distance from London so that many cyclists would stop there for a break at the Anchor Inn. Sisters Annie and Harriet Dibble encouraged the cyclists so much that, in some years in the following decade, their visitors' book was signed with over 7,000 names – all arriving on penny-farthings or boneshakers. The 2012 Summer Olympics road races started at The Mall in central London, passed Richmond and extended into Surrey to the south via Hampton Court Palace, Weybridge, Byfleet, West Byfleet, Ripley, West Horsley and Dorking then returned to The Mall via Leatherhead, Oxshott, Hampton Court Palace and Kingston-upon-Thames. Since then the Surrey 100 sportive and race have come through the village each July. Since the 1930s a bonfire has been held on the Green to celebrate Guy Fawkes Night. It is a major local event with several thousand attending to see the bonfire, fireworks and funfair. ^ "The Ripley Pharmacy and Cottage Adjoining – Ripley – Surrey – England | British Listed Buildings". www.britishlistedbuildings.co.uk. Retrieved 7 January 2016. ^ Historic England. "Details from listed building database (1029375)". National Heritage List for England. Retrieved 7 August 2012. ^ "Eric Clapton marries in Secret : BBC News". 3 January 2002. Retrieved 13 January 2012. ^ "History of Ripley Cricket Club". Retrieved 13 January 2012. ^ "Surrey History : Exploring Surrey's past – Cycling". Retrieved 13 January 2012. ^ "London 2012 website on road cycling". London2012.com. Archived from the original on 7 September 2011. Retrieved 15 October 2011. ^ "Surrey 100website". Retrieved 5 November 2011. ^ "Ripley Bonfore Association". Retrieved 5 November 2011. 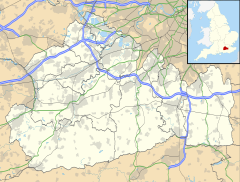 Wikimedia Commons has media related to Ripley, Surrey. This page was last edited on 26 March 2019, at 23:18 (UTC).